Capture the spirit and optimism of the 1920s with art historian Natalie Ribkoff as she guides you through the sparkling world of Art Deco. From the roaring '20s to the depths of the great depression, the luxury and decadence of the distinctive style will be fully experienced through a series of slide lectures and discussions illuminating the distinctive architecture, fashion, industrial design and decorative objects created during the Art Deco period. Beginning in Paris in 1925, we will travel to the major centers that embraced the style including New York, Los Angeles and Mumbai. 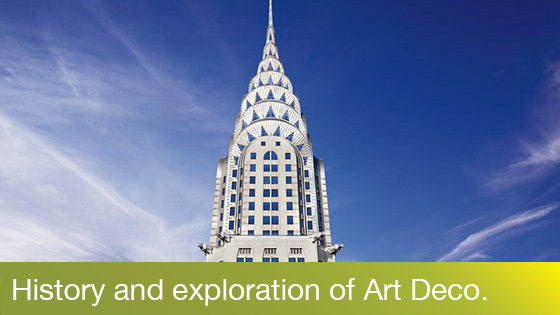 We will learn about the talented designers and artists responsible for remarkable creations and stare up at spectacular skyscrapers. Film fans in the audience will learn how Hollywood films helped to spread this irresistible style around the globe. The course will be led by fine art advisor and art historian, Natalie Ribkoff. As a professional art advisor, Natalie has extensive experience providing art advice and collections management services to a number of Canadian corporations and private individuals. An energetic educator with a passion for the visual arts, Natalie teaches Art History at the School of Continuing Studies, University of Toronto. We begin our journey into the wonderful world of art deco by examining the sources and inspiration that contributed to the distinctive look of the style including monumental skyscrapers, Diaghilev’s Ballets Russes and avant-garde artworks. This week's discussion focuses on the Exposition Internationale des Arts Décoratifs that was held in Paris in 1925, a defining moment in the evolution of the Art Deco style. Competing with the Eiffel tower for attention, the pavilions at the fair provide a showcase for the magnificent objects and jewels produced by the world’s most talented artists and designers. From the exquisite rounded furniture of Jacques-Émile Ruhlmann to the avant-garde creations of Eileen Gray, we will learn how France’s leading artists and designers ensured that France maintained her position as the leader in the production of luxury goods. Fashionistas will discover the origins of the iconic black dress and the flapper fashions of Coco Chanel and Sonia Delaney. With lighting that stressed the spectacular and decorative details that prompted eyes to gaze upwards, impressive skyscrapers including the Chrysler and Empire State Building changed the skyline of Manhattan. We’ll learn how a distinctly American Art Deco style was born as designers incorporated the imagery of the iconic structures into everything from teapots to bookcases. This week we escape into the Hollywood hills to celebrate the films and style of Los Angeles. Our star gazing takes place in a magical environment that includes grand movie theatres as well as the famous towers of the Eastern Columbia Building. From the comfort of your seats we will cross the ocean and discover what the two cities have in common beyond the "M" in their names. This weeks lecture will take us inside the decadent palaces of the Maharajas as well as the sun drenched hotels of South Beach. See all Curious Minds courses for Winter 2017.